My review of Bob Trailer for bicycle. I used a Bob Trailer in 1995. It tracked well, but had some design flaws. They may have improved it more recently. In 2002, I saw one parked. It looks slightly better, but still has some problems. The trailer comes with a quick release skewer to replace the regular one through the bicycle's back axle. This special skewer provides hitches, on both sides of the wheel, for the trailer assembly to hook over. Assembly has dropouts that are designed to hook over back wheel skewer. These are similar to the dropouts on a bike frame. Assembly must line up with skewer, but the assembly dropouts will bend easily. It doesn't fit well after some use. Parking bike can be tricky. If bike tips to one side, it puts stress on dropouts in assembly. It is hard to park the bike, especially in bike racks, as that trailer is there also. It complicates things. The best place to park is along a wall or fence, if available. It is good to have something to hold up the bike. I had a kick stand, but a loaded bike is still unstable, even with a kick stand. As it starts to tip over, which is common, it bends the trailer hitch dropouts. Then the hitch is connected to the rest of the trailer by a swiveling pin. It can easily shear off. Another problem is the bag that came with it. I didn't buy the bag as the only color was black. In the hot sun, black would cook everything inside. Cameras, food, or what ever would not like those high temperatures. Instead of paying extra for the bag, I went to a super market and got a $10, or so, Rubber Maid plastic tub with a white lid. It was clear plastic and fit the Bob Trailer just right. Trailer rode well, but had its delicate design flaws. I think that a style that hooks to seat post might work better. There are many other styles of bike trailer available, but this is the one I tried. To Robert's bike touring photo album. 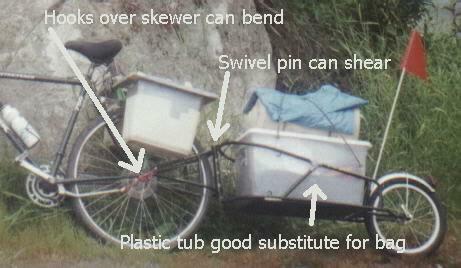 About my home made panniers.